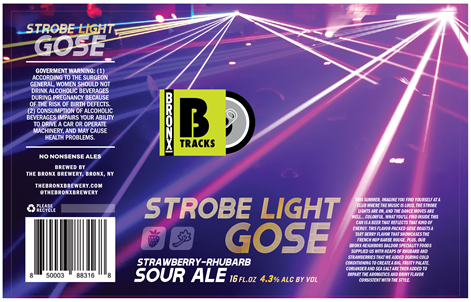 The Strobe Light Gose – a beautifully red-colored and flavor-packed gose, boasts a tart berry flavor, showcasing the French hop, Barbe Rouge. Additionally, there are heaping helpings of rhubarb and strawberries added during cold conditioning to create a big, fruity pallet. Coriander and sea salt are added to the brew to create the briny and aromatic flavor consistent with the style. The limited-edition beer will be available in The Bronx Brewery taproom on draft and in cans beginning on April 6. In addition, for the first time ever, a B-Tracks beer will be available outside of the brewery, with Strobe Light Gose on draft at Clinton Hall locations. Given their limited quantities, the B-Tracks series of beers will be available at The Bronx Brewery’s taproom and Clinton Hall locations for a short time. The taproom is located at 856 East 136th Street, Bronx, NY 10454 and is open seven days a week.